Artist rendering of what the Hazeltine Park Nature Patch could look like. If you attended our April 5, 2018 meeting, then you’ve already seen the excellent concepts for the Hazeltine Park Nature Patch. Eric Rosewall of Portland Parks and Recreation presented two concepts for consideration. View those concepts below and then CLICK HERE TO VOTE. This poll will remain open through April 20, 2018. Six New Carts at Cartlandia! Check out the SIX new carts now open at Cartlandia! Mark brought his years of baking experience FROM KENNY AND ZUKES to open his first food cart featuring bagels mixed, hand-rolled boiled and baked in the cart. At least 12 different types of bagels will be offered at one time along with spreads, breakfast and lunch sandwiches and , bagel chips and COFFEE, hot tea and hot chocolate. All bagels $1.25 COFFEE $1.25 tea $1.25, sm cocoa $1.00. A new concept with pancakes and a variety of fillings at a great price! You can make your own too! Bee’s Cakes is an Airstream Coffee shop, serving breakfast pastries, sweets and desserts. She will also specialize in special order cakes for birthdays and weddings as well. Rebecca is a trained pastry chef that has a passion for Coffee and customer service! The popular Moroccan cart La Camel has relocated to Cartlandia March 2018. Karim cooks up the traditional dishes of Tajine, Couscous, Paella, Sandwiches and Salads. Vegetarian options too. Moroccan Kefta and Eggs Tajine – This dish is what makes Morocco. Shakshouka tomato and onion stew, Moroccan seasoned beef meatballs topped with poached free-range eggs and served with pita bread $8.75. Our mission is to showcase the flavors of the Northwest woods by creating healthy meals using whole, locally-sourced, seasonal ingredients. We cook exclusively in a wood-fired oven to ensure the most authentic flavors in each of our dishes. Chef Brandon started his career in Minneapolis while attending culinary school. He quickly found his niche while working at the James Beard nominated Tilia under chef Steven Brown. While at Tilia, Brandon discovered how to create a menu that showcases his love for the outdoors and his passion for fresh, local ingredients. Owner and chef PETE says ‘I look forward to serving Cartlandia customers the food I love to cook. Soul food. It’s a variety of food including traditional southern and Italian.Serving Fried Chicken and Sides and the BEST prime rib sandwiches. Help us welcome the newest business to Brentwood-Darlington, G.I.R.L.S. Gym! G.I.R.L.S. Gym offers Martial Arts, Kickboxing, Fitness, Submission Grappling and Self Defense training for women, teenagers, and youth. Classes offered 7 days per week, morning, midday and evening. Be part of this amazing community of women! Visit them online or at their location on SE 52nd, just north of Flavel St. between La Mota and the ASAP Market. Neighborhood Assessment and Action Plan Completion and Report! Through the Master of Urban of Regional Planning (MURP) program at Portland State University (PSU), we have the pleasure of completing a practical and applied planning process with a client and community in a short 6 month timeline. Luckily, a group of six MURPs, took the opportunity to work with you, Brentwood-Darlington and the City of Portland to complete a Neighborhood Assessment and Action Plan. We first would like to say thank you. Brentwood-Darlington is an amazing community with motivated individuals that influence positive change everyday. It has been a true pleasure meeting all of you, building important relationships, and working together to develop this plan. We could not have done it with you. Based on the project proposal and initial conversations we had with Marty Stockton, Southeast District Liaison for the City of Portland Bureau of Planning and Sustainability (BPS), we identified that increasing livability and stability for BD residents was the city’s primary goal. Additionally, the city wanted to better understand the most pressing challenges BD faces. In our first conversations with residents, you asked us how to strengthen neighborhood identity and engage diverse voices in the neighborhood. As well as, you wanted to build off of current momentum and understand how to be more effective advocates in addressing your infrastructure challenges. From neighborhood walks to multi-cultural focus groups, we learned a great deal of information from the people in your community. The most overwhelming thing we heard from you was infrastructure deficiencies and sidewalk concerns. We learned about your amazing and successful grassroots organizing history from interviews with neighbors that have been in BD for over 50 years. Our neighborhood survey told us that many of your moved to the neighborhood for its affordability and the opportunity to buy a home. All of these interactions with people within Brentwood-Darlington framed our conversations with technical and academic advisors, professional mentors, non-profit organizations and many more. These conversations outlined what all is possible for the neighborhood via collaborations with constituents around the city. The Brentwood-Darlington Neighborhood Assessment and Action Plan is meant to inform the City of your most pressing challenges and priorities for the future. We hope this project and our final plan serves as a guide and a touchstone; a reminder of where the neighborhood has been, and an arrow pointing the way to the community’s shared vision of the future. We invite you to celebrate with us, ask us your questions and discuss how the neighborhood can take action and move forward with positive change at our Neighborhood Celebration on June 25th at the Brentwood-Darlington Community Center. There will be an ice cream sundae bar, cake, yard games, and more! We hope to see you there to celebrate what an awesome community you have and one that we enjoyed to work with ever so dearly. View the documents on Google Drive and see all the amazing work that these PSU students have put into our neighborhood! Did something strike a chord? Join us for our next meeting on July 6th at 7:00PM at the Brentwood-Darlington Community Center or contact us today! Brentwood-Darlington got a little bit softer in September with the addition of a lovely yarn shop! 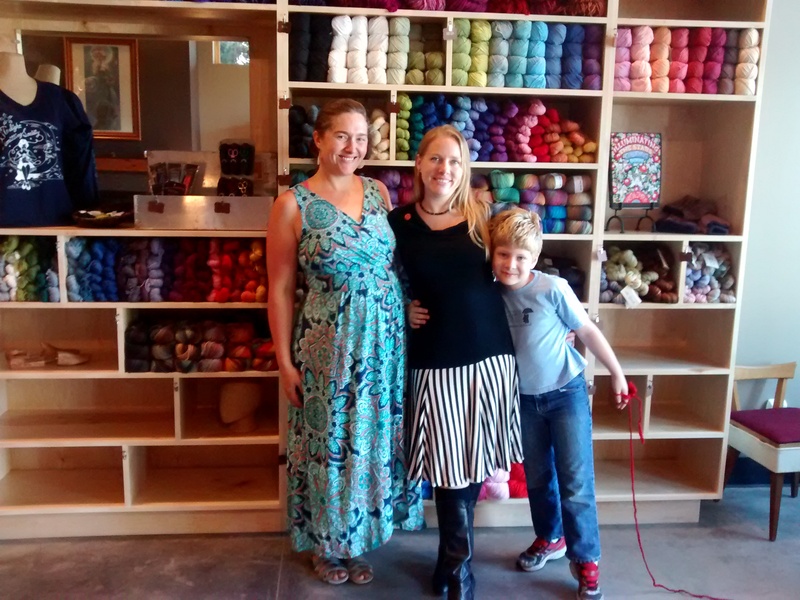 Starlight Knitting Society, located at 7028 SE 52nd Ave, is Brentwood-Darlington’s newest local business. Owner Melissa and her staff have worked hard to make an inviting and beautiful environment. Thoughtfully curated yarns in a variety of textures, weights, and fibers line the walls. From Blue Sky Alpaca to Spud & Chloe to Universal Yarn, there’s something for everyone (and every wallet). A cozy fireplace with comfy seating and well-placed lighting invite you to sit and stitch a bit. Thoughtful details like a children’s play area, warm beverages, and a large work table make this shop a haven for the yarn inclined. Starlight Knitting Society is open Tuesday through Saturday, 10am-6pm, and Sunday 12-5pm, with open stitching nights Wednesday and Thursday from 6-9pm.